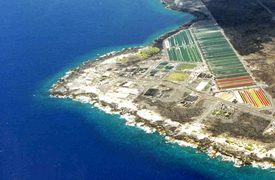 An aerial view of the NELHA facilities in Kona, Hawaii. Makai has installed undersea pipelines that descend to 915 m (3,002 ft) water depth at a temperature of 4° C (39° F). Seawater Air Conditioning (SWAC) takes advantage of available deep cold water from the ocean, a river, or lake, to replace conventional AC systems. Such a system can also utilize cold lake or river water as the cold source. SWAC feasibility studies for a variety of sites indicate that electrical consumption is typically reduced by 80 to 90 percent. Simple payback can be from three to seven years, and long term costs can be half that of a conventional air conditioning system. Makai Ocean Engineering offers a full range of engineering services for seawater air conditioning analysis and implementation. Makai can provide technical and economic SWAC assessments, offshore surveys, environmental analysis, review of permit needs, deep water pipeline design, conceptual through final engineering design, cost estimates for construction and operation, and construction management. Do you have a large cooling load near a natural body of water? Contact a Makai engineer to learn if a cooling system that uses an ocean, lake, or river can benefit you! If a site with high air conditioning costs has no access to cold seawater, near shore seawater can also be used to reduce air conditioning costs. This is done by replacing an air-cooled or evaporative cooling tower cooled condenser with seawater cooling. If the condensing temperature of a conventional chiller unit can be reduced, energy savings will result. The amount of energy saved will depend upon the change in condensing temperature. Shallow surface seawater will typically be much cooler than the air, especially during the hottest time of year. Thus, an air-cooled condenser can be replaced by seawater cooling and obtain 25% or more energy savings. If the chiller uses an evaporative cooling tower for condenser cooling, usually shallow seawater can both improve chiller performance and can eliminate the noise, water demand and sewage fees associated with the evaporative cooling tower. 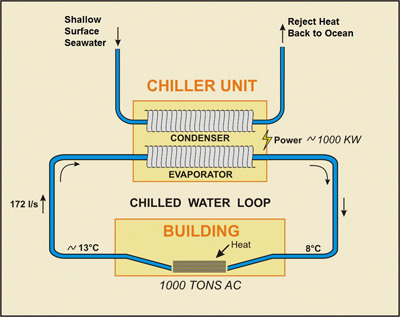 The figure on the right shows a schematic of a conventional chiller with its condenser cooled with shallow surface seawater. The existence of the deep water ocean heat sink results from natural climatic processes where water is cooled at the poles, becomes dense and sinks to deeper water. The figure at right illustrates a temperature profile in the tropics typical for the world’s deep oceans. 7°C or colder can be reached at 700m depth, 5°C or colder at 1000m. The deep-water portion of this profile changes little seasonally and therefore cold water is available on a year round basis. There are significant secondary applications for this seawater. Secondary cooling, aquaculture, desalination and even agriculture can benefit from the cold seawater. Aquaculturists value the water because it is clean and disease free. When used in conjunction with a warm source of water, they can have any temperature seawater their product needs. Secondary cooling can be used in greenhouses and other locations where humidity control is not a major factor. Finally, research in Hawaii has shown that even an arid land can be made highly productive with low fresh water consumption by cooling the soil and the roots (resulting in condensation) of many tropical and non-tropical plants. Deep seawater is also desalinated and sold as a premium drinking water in Asia. The figure above is an aerial photo of the Natural Energy Laboratory of Hawaii Authority (NELHA) where many of these secondary applications are being used and researched. For over 25 years, Makai has continuously developed custom software for modeling the hydraulic and thermal aspects of fluid networks, and recently underwent a major overhaul with the help of a U.S. Navy research and development grant. Notably, the cost algorithms were upgraded and now account for 160 various costs applied across a dozen of the key construction steps for district cooling systems. This software have been used to model, analyze, and design district cooling networks, and especially SWAC district cooling systems. The model, called the Makai Economic, Thermal, and Hydraulic Optimization and Design software, or METHOD™ software, takes into account all of the major capital and operational costs for both systems and the complex interplay between the sub-system designs and operational costs. This enables an “apples-to-apples” economic comparison of district cooling versus an equivalent conventional A/C system. Other financial metrics, such as payback period and rate of return of the district cooling system, are also computed. The METHOD™ software consists of two main components: an engineering and an economic model. It considers the primary engineering and economic parameters associated with a particular SWAC site, produces a conceptual design, and provides a fair comparison of the cost of cooling provided by SWAC versus conventional air conditioning. In order to reduce the costs of a district cooling system, METHOD™ is used to design and optimize components to minimize the overall levelized cost of cooling. The software is particularly useful for providing quick and cost-effective “what if” analyses to help the developer decide between possible design variations early in the project, such as evaluating whether or not to add a nearby A/C customer to the network. Users can instantly see the effect on levelized cost due to a change in the network. 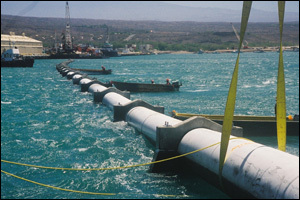 In the case of a SWAC system, METHOD™ includes accurate costs for the offshore seawater pipes that are derived from real construction projects – these are necessary to get an accurate project cost, and are something only a firm with significant offshore pipeline construction experience can offer. More than 25 years ago, Makai created the original SWAC model, and our engineers have been improving its functionality ever since. 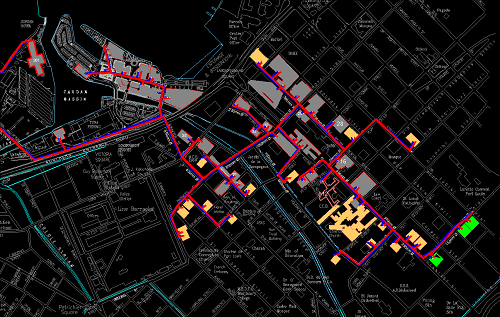 The above screenshot shows the model being used to design another SWAC district cooling system in Mauritius for Urban Cooling. Once a layout is defined by the user, the major system components (deep seawater pipes, chilled freshwater network, etc.) and operations (pumping power, maintenance, etc.) are then optimized for a minimum cost of cooling. The Caribbean study suggests that district cooling is a clear economic and environmental winner versus conventional A/C. The software defines the parameters (e.g. sizes, lengths, flow rates, power requirements, etc) for each of these major components. 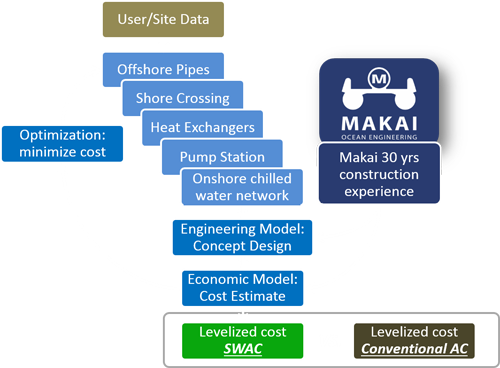 Economic model: Once an initial conceptual design is complete, Makai uses the software to assign a cost for the design, construction, operation and maintenance to each component in the SWAC system. The model then runs an optimization algorithm to minimize for the levelized cost of cooling. The optimized design then produces a cost estimate that allows a fair economic comparison between SWAC and conventional air conditioning, using a levelized cost analysis. Usually a SWAC system must look significantly better than a conventional AC system solution before Makai will recommend it. Makai’s economic model is based on an analytical procedure developed by the Electric Power Research Institute (EPRI) in their Technical Assessment Guide [TAG]. The TAG model is an economic analysis method of comparing two alternate energy systems with different capital and operating costs. One of the most important inputs to the economic model is the cost of the large and unique offshore pipelines. Makai’s strength is our extensive experience and knowledge of costs associated with constructing and installing large marine pipelines, as will be discussed below. No other firm has such an intimate knowledge of the costs of these unique submarine pipelines. The key cost and risk component of any SWAC system is the offshore pipeline. The lack of a low-cost methodology for the installation of these pipelines prevented SWAC development in the 1970’s and 80’s. Today, the technology for the successful installation of large diameter (>2 meter) pipelines to depths of 1,000 meters and greater is available. Numerous successful deep seawater intake pipelines have been designed by Makai that were installed and operated successfully – not a single one has failed due to a design flaw. Many of these pipelines have been for Seawater Air Conditioning (SWAC) systems. Click here to see a summary of some of Makai’s experience in pipeline design, analysis and deployment. Makai has been working on SWAC projects consistently for more than 20 years. Our database of worldwide site information and experience with successful SWAC projects enables us to assess a site rapidly for its viability. For those interested in developing SWAC systems, Makai provides a preliminary opinion of viability free of charge. If the site looks promising, Makai will propose one or more options for a SWAC feasibility study for your particular site that fits within your budget. New Renewable Energy Report Released: Seawater Air Conditioning in the Caribbean: The study was commissioned by CAF – Development Bank of Latin America, with co-financing from the Agence Française de Développement (AFD) and used Makai’s recently upgraded district cooling software. U.S. Navy Invests in Research and Development of Seawater Air Conditioning Technology: Makai completed a contract funded by the Office of Naval Research (ONR) through the Hawaii Natural Energy Institute (HNEI) to research and develop Seawater Air Conditioning (SWAC) technology. Group 70 Tahiti Mahana Project: SWAC system design for the Tahiti Mahana Beach Resorts.